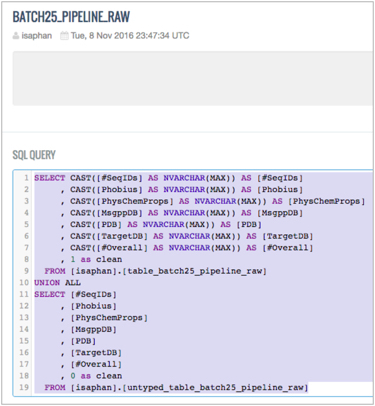 A good way to begin learning SQLShare is to copy existing queries and edit for your own purposes. You can search all datasets or only those shared with you. Once you find a relevant dataset, open it to review the associated query. To become more familiar with queries and a few SQL commands, view this sample dataset and its associated queries. In SQLShare, click All or Shared. In the search field, enter a relevant search term, such as a word or phrase that you expect to appear in the data. If SQLShare returns datasets, you can open these to find a relevant query. From the search results, open a dataset. Edit the query as desired. See examples of edited queries.